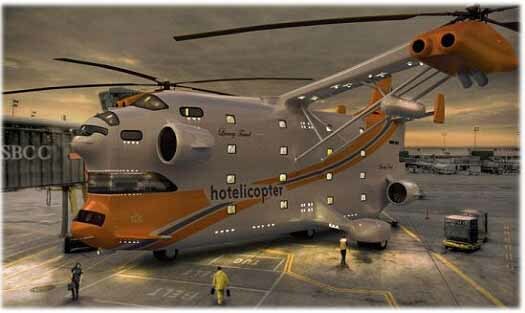 Hotelicopter is the world's first flying hotel. Apparently, someone took a Soviet-made Mil V-12, renovated it and made it into an amenity-heavy hotel that flies. According to the official website, "The Hotelicopter features 18 luxuriously-appointed rooms for adrenaline junkies seeking a truly unique and memorable travel experience. Each soundproofed room is equipped with a queen-sized bed, fine linens, a mini-bar, coffee machine, wireless internet access, and all the luxurious appointments you'd expect from a flying five star hotel. Room service is available one hour after liftoff and prior to landing."